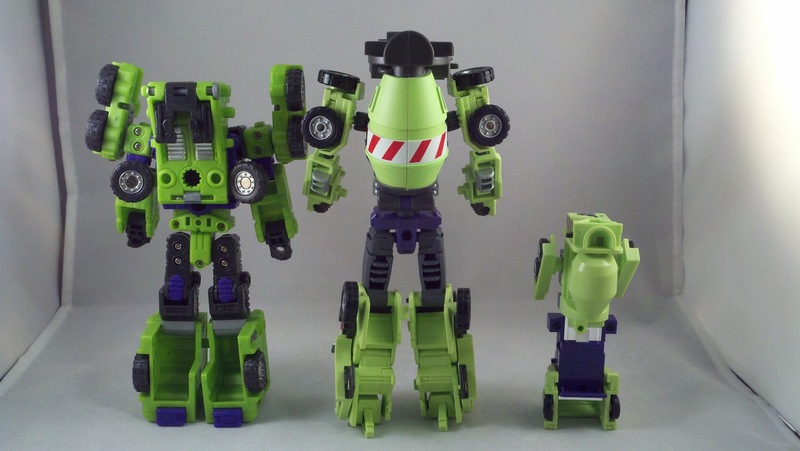 Today brings us another step closer to seeing the full glory that is the MakeToys Green Giant! 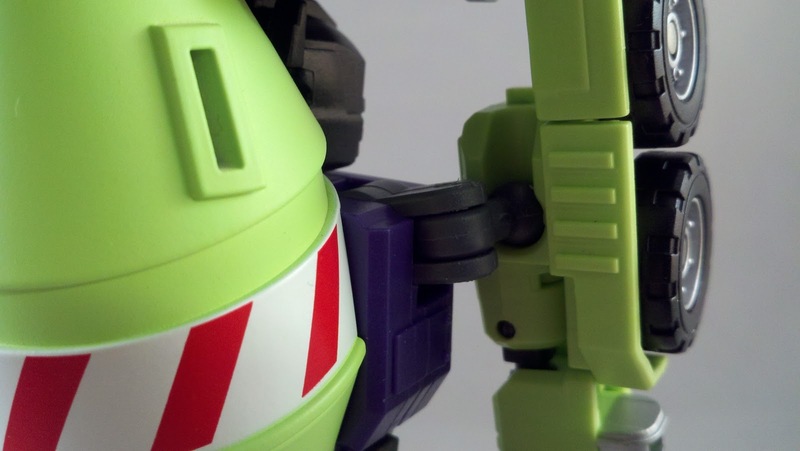 Today, we take a look at Bot #2, the second leg to the Giant, MakeToys' NOT Mixmaster. Let's take a look at Part 2 of OnePerCase's look at the Green Giant! 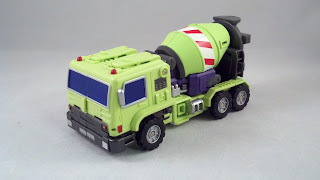 Like GG Scrapper, the NOT Mixmaster has no name that I'm aware of, so GG Mixmaster it is. 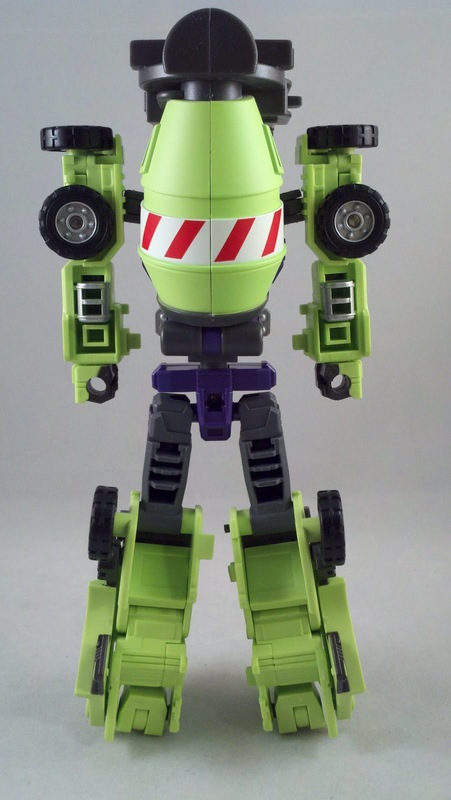 GG Mixmaster forms the second leg of our Green Giant. 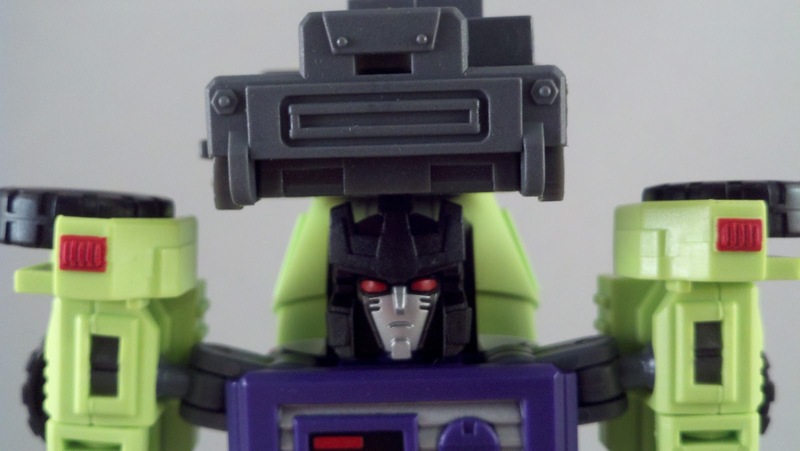 Like the rest of the figures in the set, he came transformed into Limb-mode and set into his own little spot in the plastic tray. Again, we'll take a look at the packaging when get to Green Giant himself. 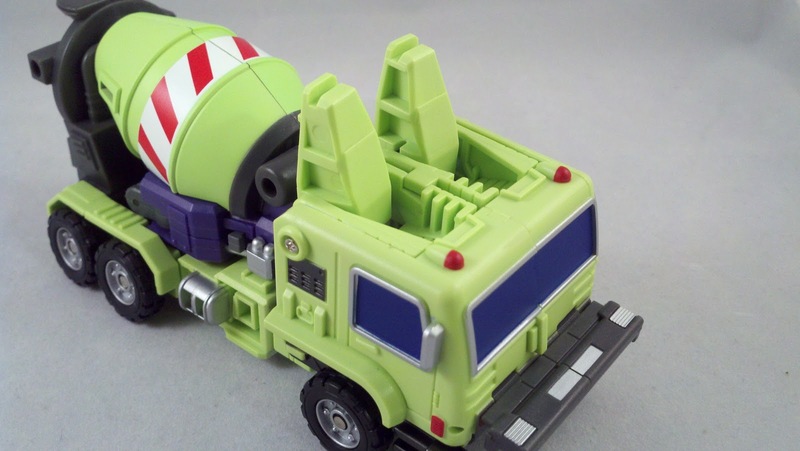 Starting in Alt-mode, like GG Scrapper, GG Mixmaster has plenty to look at. 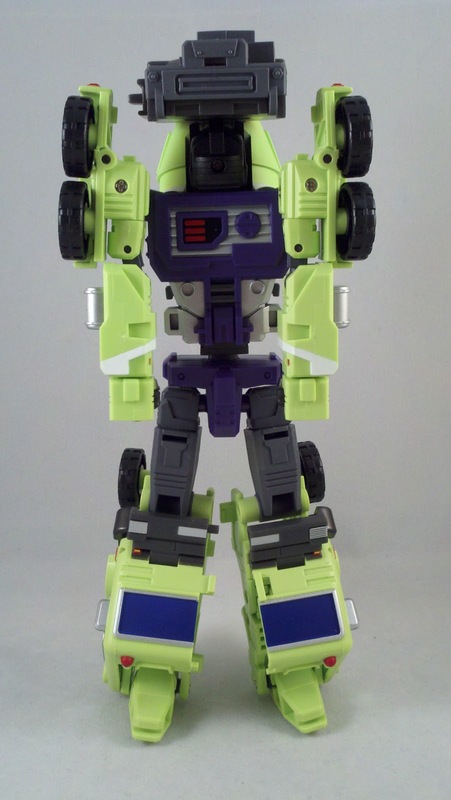 Molded in primarily in bright green he contains all sorts of details and very neatly applied paint apps. 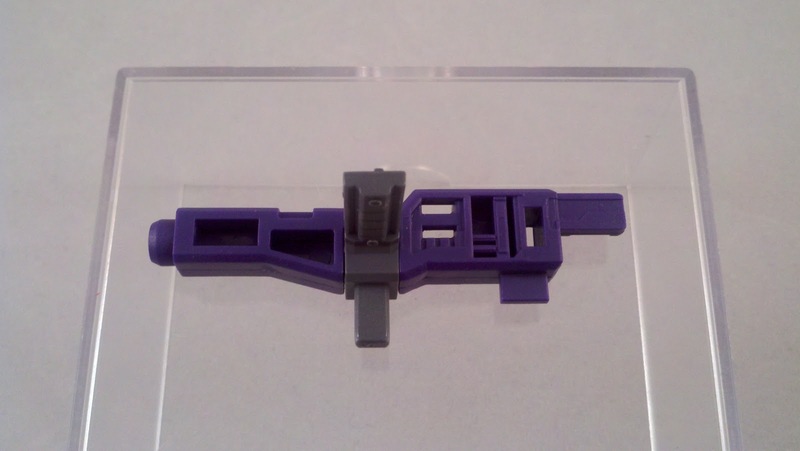 There are also parts molded in charcoal gray and silver/gray. The red and white warning striping on the mixing barrel is immaculate. 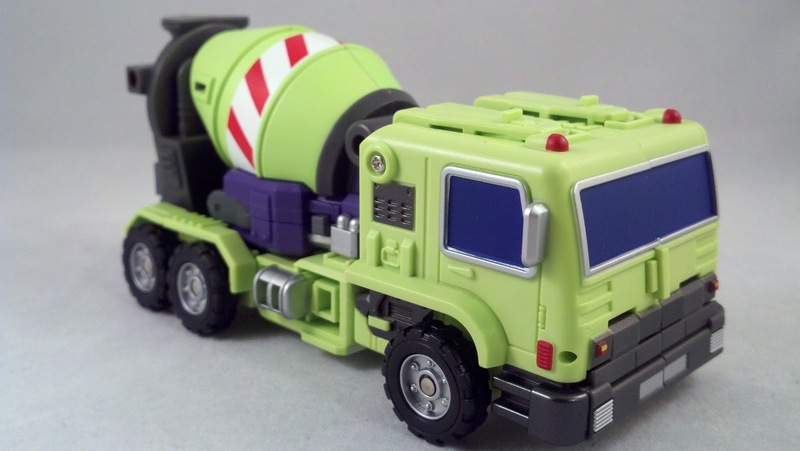 The one thing that is of note for the Alt-mode, the mixing barrel is fixed. 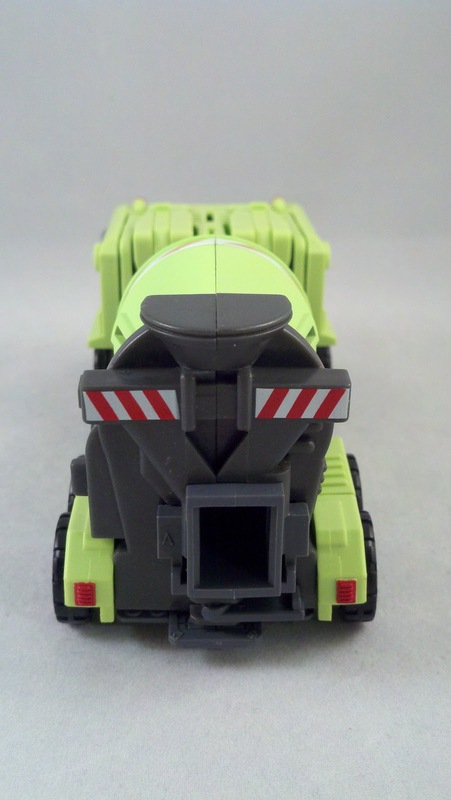 Unlike TFC's Mad Blender and the G1 Mixmaster, GG Mixmaster's mixing barrel is molded right into the figure's back. 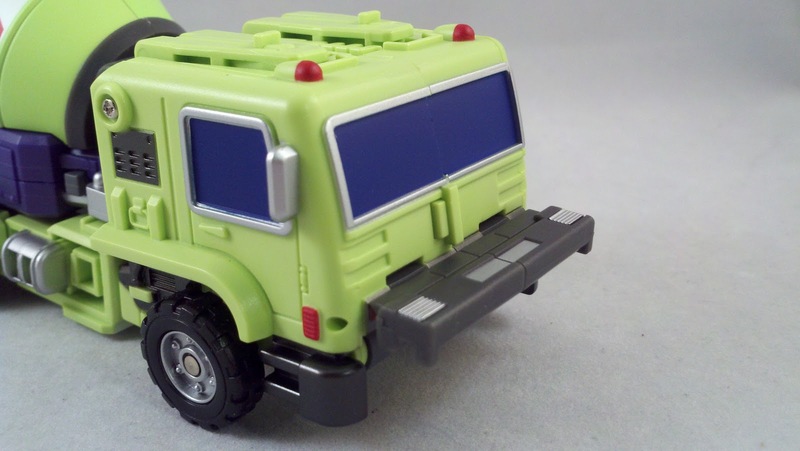 Looking at the rear of the figure's Alt-mode, you can see the square port where GG Long Haul's connector fits. 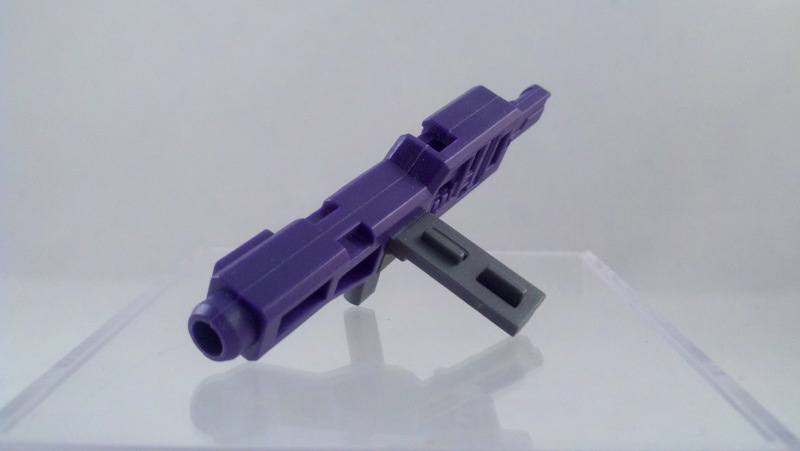 I'm sure that if the barrel did spin, there would need to be either a smaller port or some other piece for the connector. 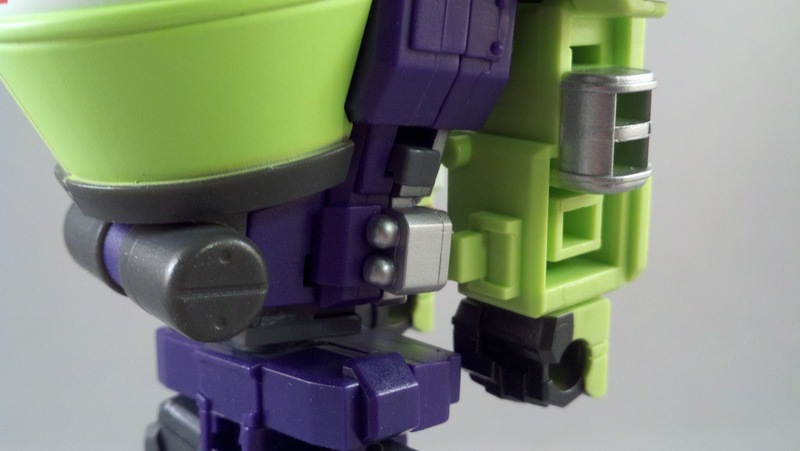 The other slightly odd thing that I noticed and can't seem to find a reason for... on the mixing barrel, on both sides... there are slots that run all the way through. 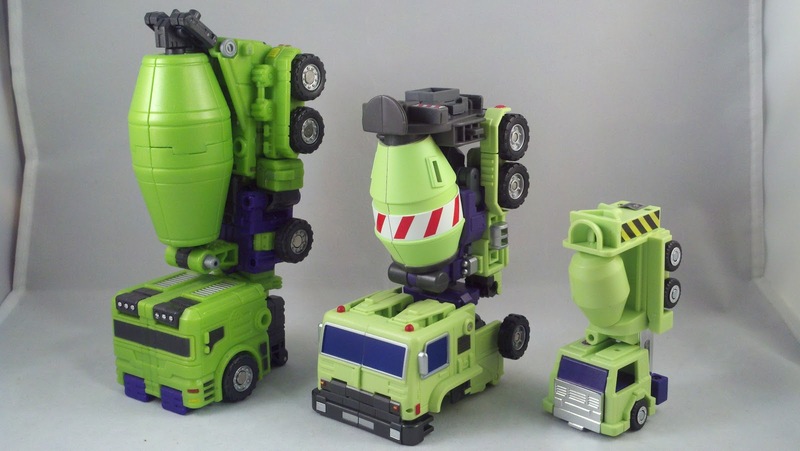 I have yet to notice anything that fits into those. They're just... there. 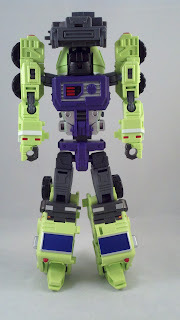 Getting GG Mixmaster into Bot-mode is fairly easy and I feel that he's not as complicated as GG Scrapper. 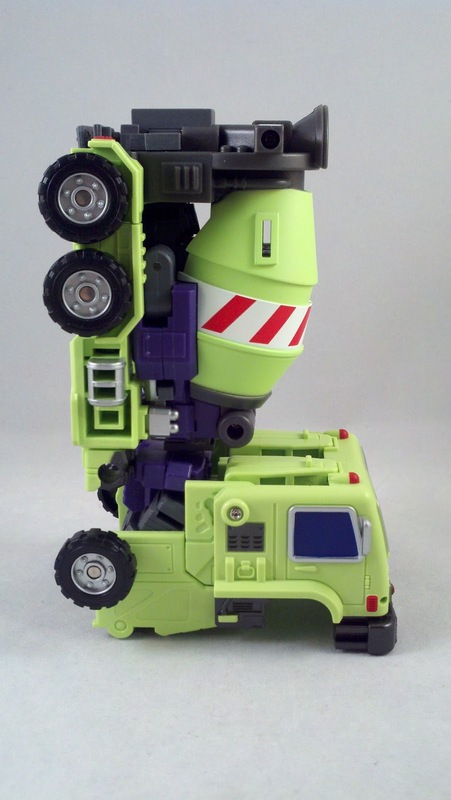 Begin by flipping up the front bumper and flipping the two parts of roof of the cab up. Unfold the cab and split it to form the legs. 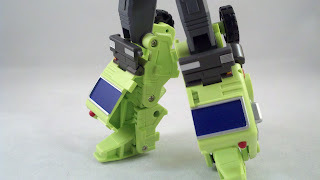 The feet have some smaller pieces in them that fold out and help with stability. 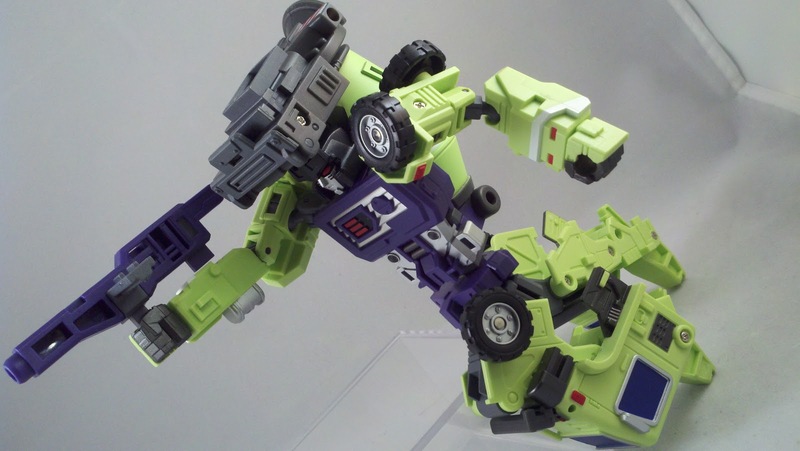 Flip the arms out from the body. 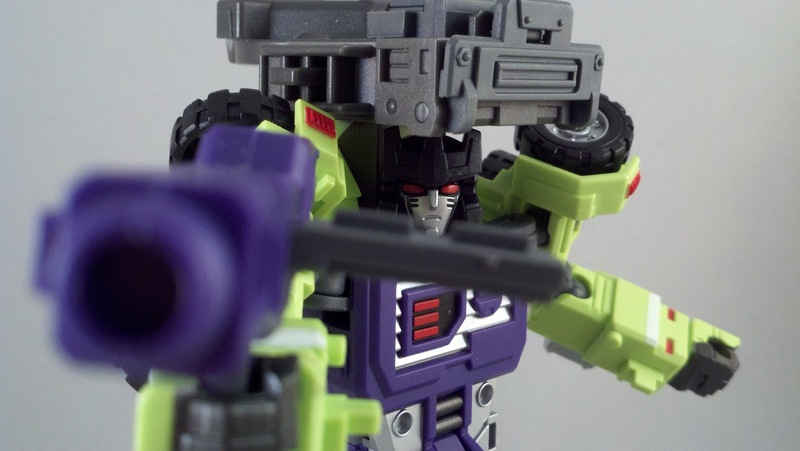 The arms are mounted on some grey posts that also swing out and down a little from the shoulders. 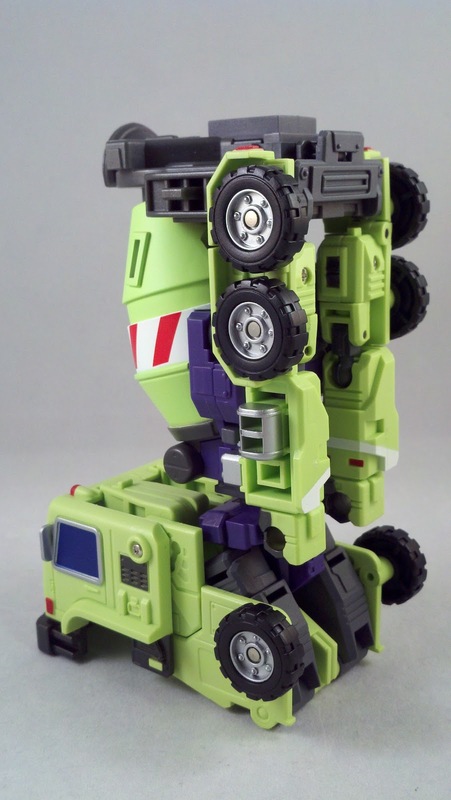 Flip the top most wheels down to cap off the shoulders. 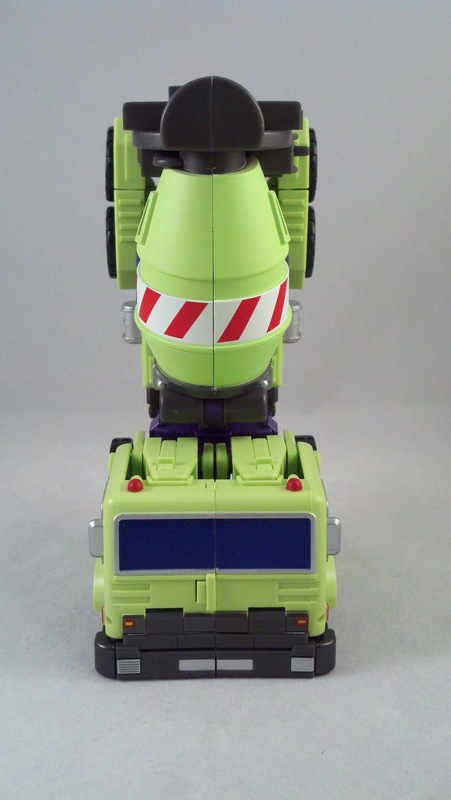 Swivel the head around to face front. 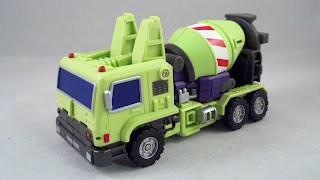 GG Mixmaster's Bot-mode is very reminiscent to his G1 mode. 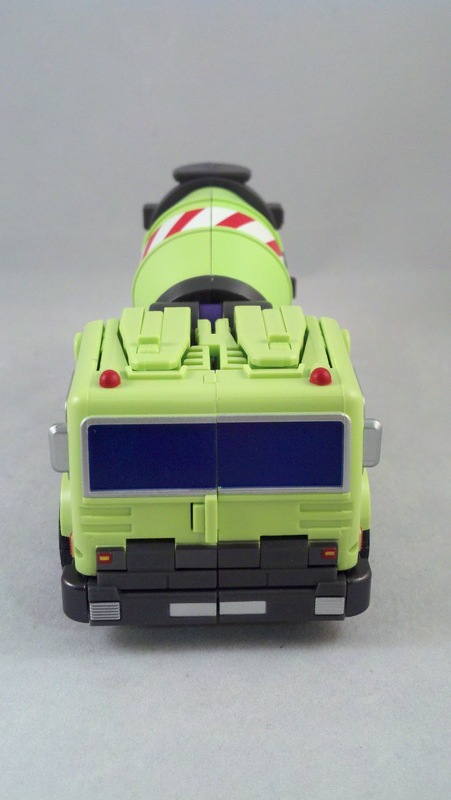 The cab of the Alt-mode as the legs and the mixing barrel on his back... it's unmistakable that this is Mixmaster. 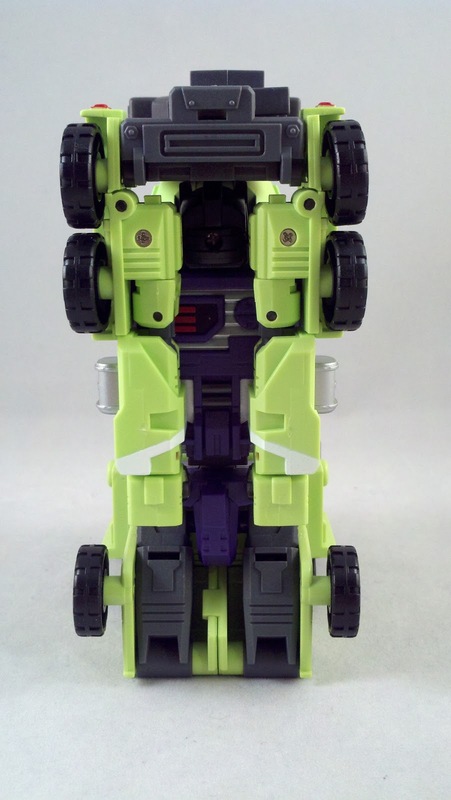 His side profile makes him look a little slim. 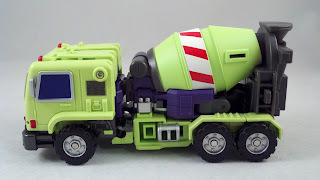 Like the rest of the Green Giant crew, GG Mixmaster takes his weapon from Green Giant's combined on. 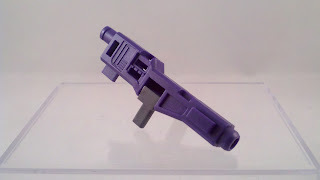 Mixmaster's is half of the combined weapon's lower part and grip for the Giant. 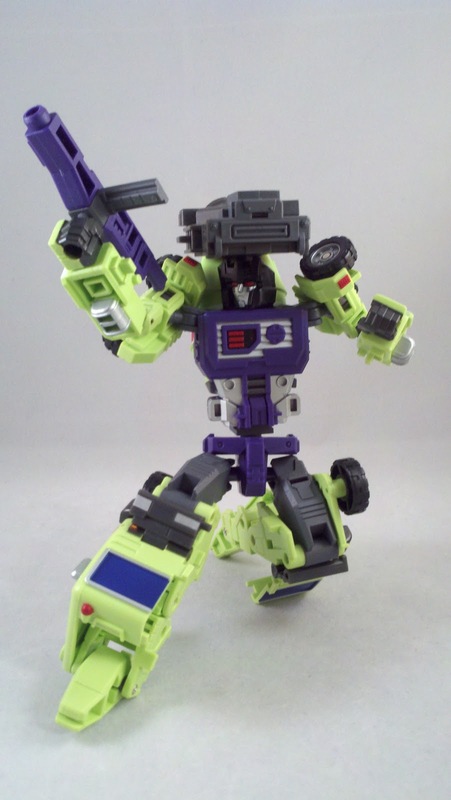 Like GG Scrapper, GG Mixmaster is loaded with articulation. 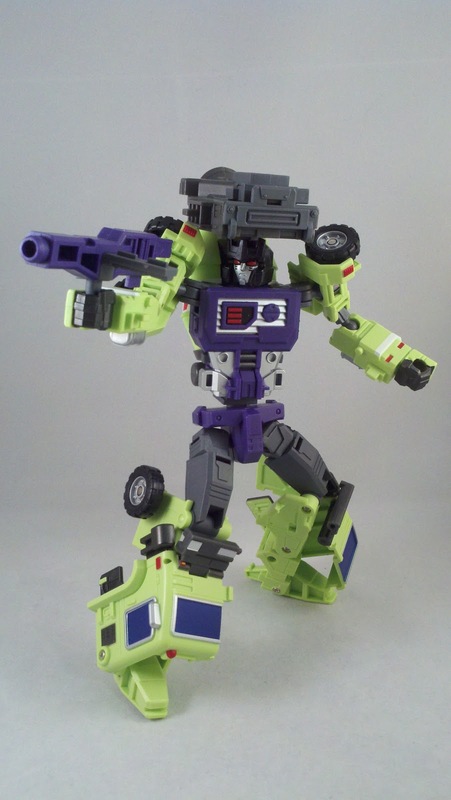 Unlike GG Scrapper though, his shoulders are engineered to allow a much wider range of motion. 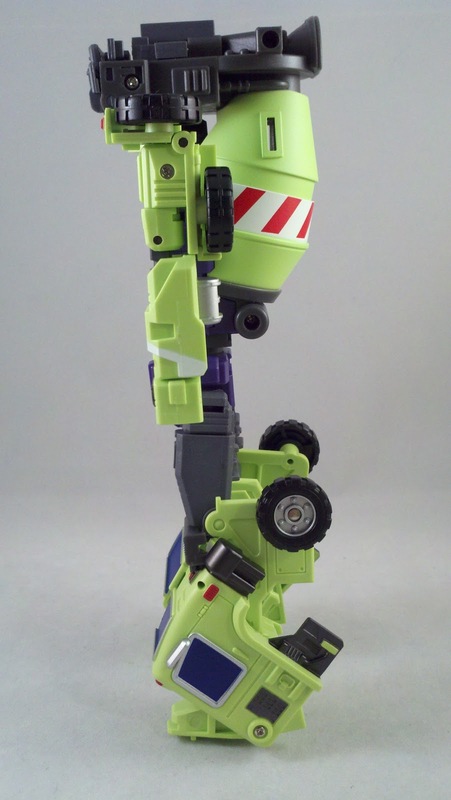 Getting GG Mixmaster into Limb-mode is just as easy as his TFC cousin and G1 counterpart. 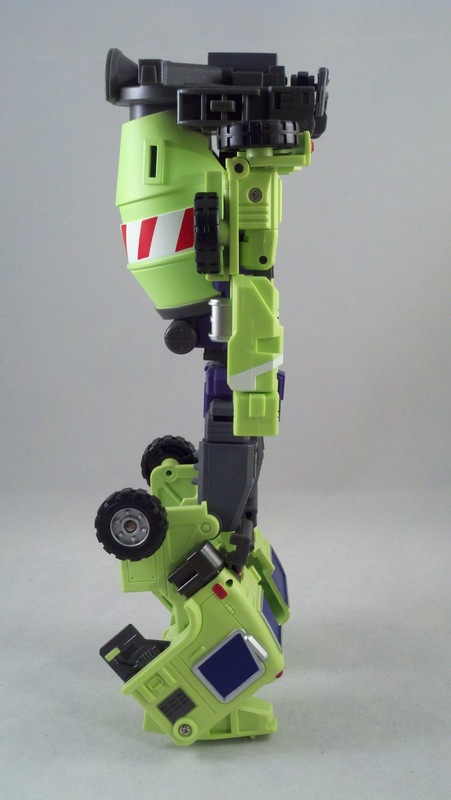 Starting from vehicle mode, flip up the feet, flip out the cab leaving the rest of the Bot-mode leg bits folded up. It really is that easy. 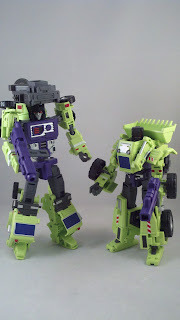 Size wise, GG Mixmaster practically towers over GG Scrapper... he really is quite a bit taller. Though, their respective Alt and Limb-modes are of equivalent size. 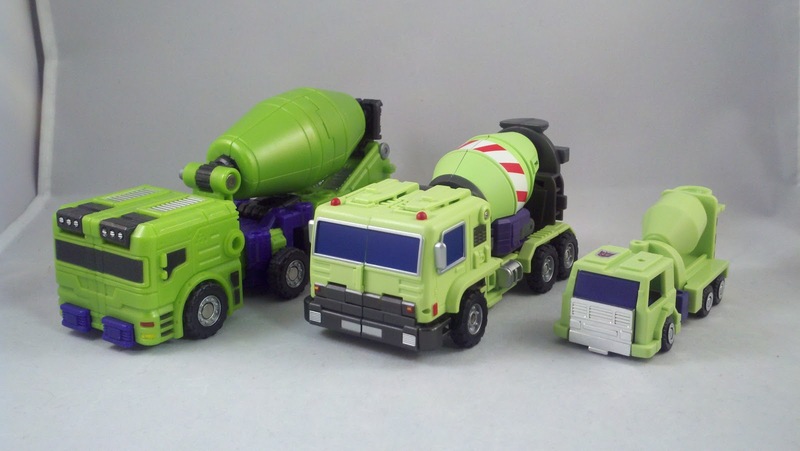 As compared to his brethren Mixmasters... surprisingly GG Mixmaster is the same size as TFC's Mad Blender if not a tad taller, and he certainly dwarfs G1 Mixmaster. 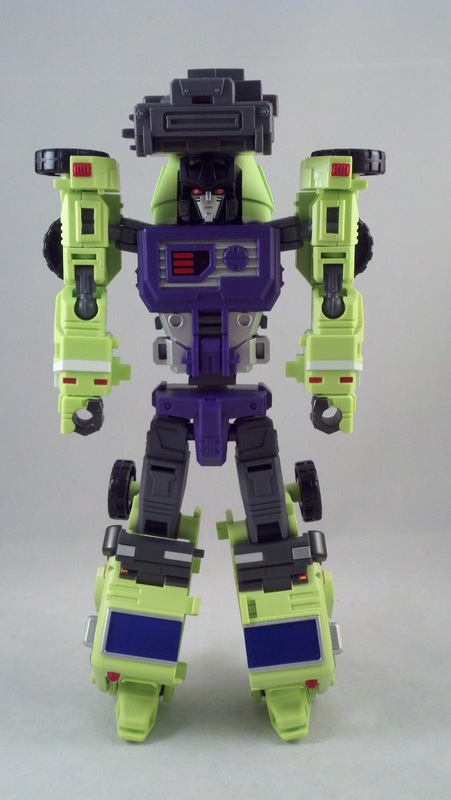 While Hercules is a nice green and purple, I feel the colors on Green Giant are much more true to the G1 scheme. Once again, I'm impressed with the Green Giant figure set. 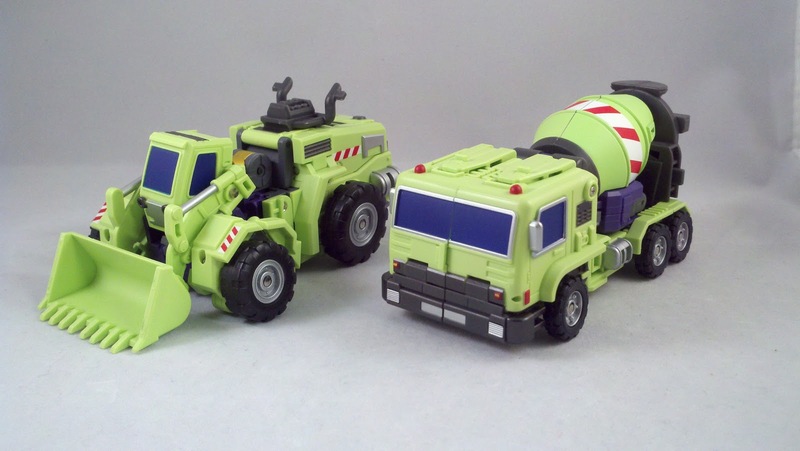 GG Mixmaster is an excellent homage to his G1 counterpart in both color and look. 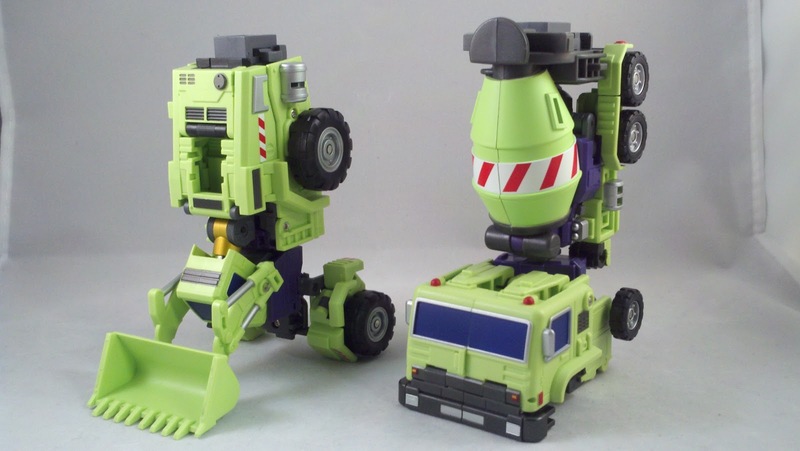 GG Mixmaster definitely beats GG Scrapper in the arm articulation department though. 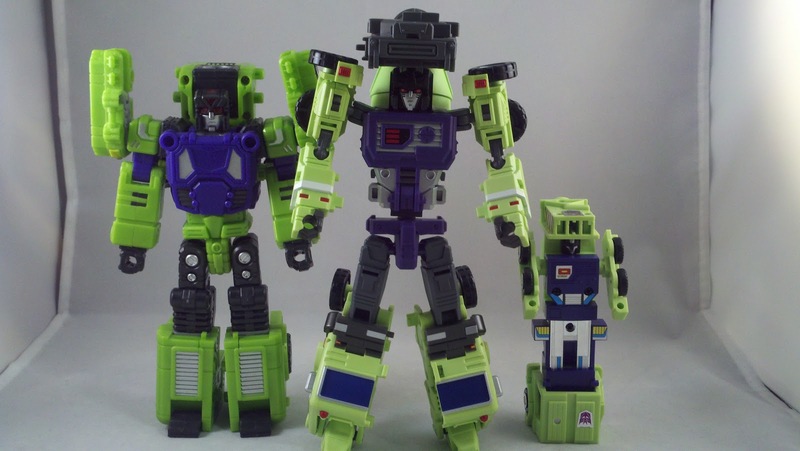 Nonetheless both of the Devastator homages are nice pieces to have. Stay tuned as we have plenty more to go through. 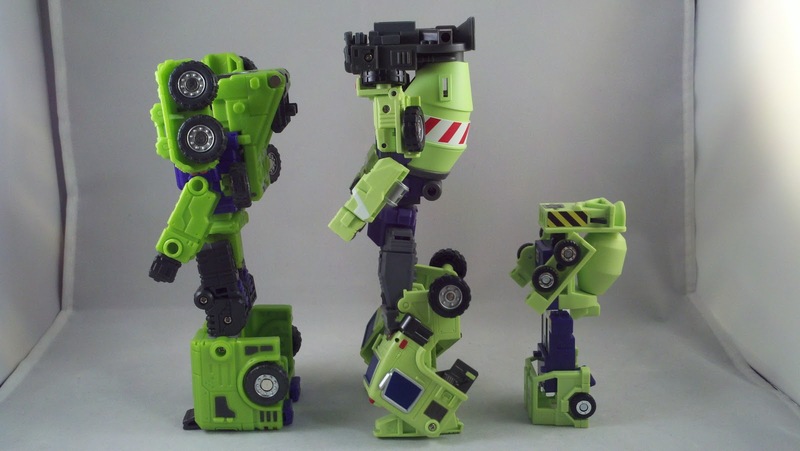 Next up is Green Giant's lower torso and upper legs, GG Long Haul! 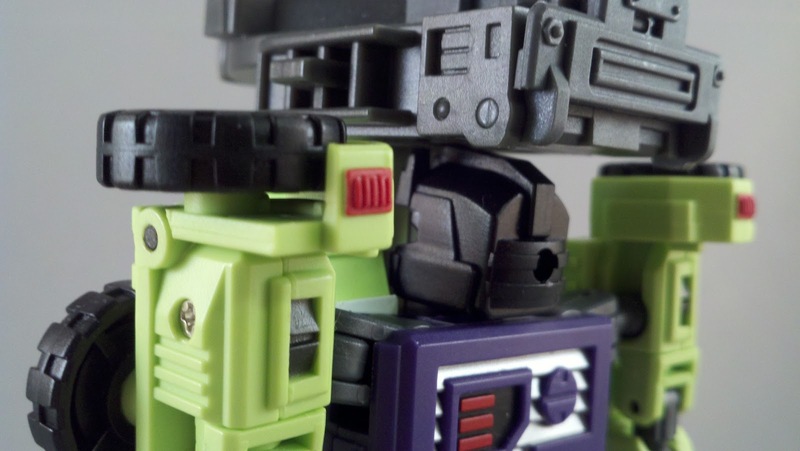 Pics, review, and mixed drinks by Scion of Primus.